Jesse and Mary Baker Foulke were both born in Pennsylvania and by April 1843 when they married they had moved to Highland County, Ohio. The couple had 5 children in Ohio and Jesse was listed as a farmer, and the value of their farm was listed as $2200.00 on the 1850 US Census in Harrison County, Ohio. According to a Hamilton County history book, Jesse was also a Cooper, but after coming to Hamilton County he devoted all his time to farming. In the fall of 1850, when the children ranged in age from 6 to 1 year old, the family made the move from Short Creek Township, Harrison County, Ohio to Jackson Township, Hamilton County, Ohio. Harrison County is located in the east-central portion of Ohio and Short Creek Township is in the south-east corner of the county. Hamilton County, Indiana is located in the center of the state just north of Indianapolis. The family traveled a distance of about 300 miles on the journey to their new home. When they first arrived they resided near the small town of Cicero. About 1852 the family purchased 285 acres in southwestern Jackson Township. This land is located on both sides of present-day Anthony Road south of 236th Street. The portion on the western side of Anthony Road consists of 102 acres this is where Jesse and Mary built their home and barns. The remainder of the land on the east side of Anthony Road stretched between Anthony Road and Deming Road along 236th Street. In 1880 236th Street was named Cicero & Hinkle Creek Gravel Rd. Anthony Road is located about 5 miles west of the town of Cicero. You can see the layout of the land on the maps shown below. This 285 acres became the Jesse Foulke Farm and was home to Jesse, Mary and their 5 children. In the 1860 Census the value of the farm is listed at $12,000.00. The entire family was living on the Jesse Foulke Farm. Also living with the family was Amasa Baker, father of Mary, who was 79 years old at the time. In 1864 the oldest son, John Baker married Mary Hodson on 2 April in Hamilton County. John Baker would later have a portion of his parents farm and also land in Adams Township. The year 1866 shows the acreage of the Jesse Foulke farm to be 284 acres according to the map below. Also in the 1860s the huge barn on the Jesse Foulke Farm hosted several large meetings and gatherings including some where the subject of Spiritualism was discussed and debated. Other meetings were held in this barn during this period including religious meetings of various kinds. On the opposite side of Anthony Road at the time was located the Mt. Pleasant Church and cemetery where religious gatherings were held. The cemetery remains but the church is long gone. Daughter Sarah Ann married William Francis McShane on 26 February, 1868 in Hamilton County. Sarah would later have a portion of the Jesse Foulke farm. Sometime around 1868 Jesse & Mary rented their farm to sons George and Amasa and had moved to the Westfield vicinity where it was reported in August of 1870 they were building a new house. Jesse was listed as a retired farmer on the 1870 Census and the value of the real estate (in Jackson Township) was $18,000.00. This Census shows them to be residing in Washington Township. On 16 November 1873, Lucetta Foulke is murdered. There is much controversy to this day about whether Amasa shot her. From early 1874 through February of 1875 Amasa stood trial for the charge of murder. The first trial in 1874 found him guilty. He petitioned for, and was granted, a new trial which took place in February 1875 at which he was found not Guilty. Several of the family members, including Jesse, Mary and George testified at the second trial. This trial had to have been a tragic event in the family and Jesse, George, John Baker and others supplied the bond for Amasa. George Foulke and Narcissa Wilson were married on 19 January 1875 in Hamilton County. Narcissa was the daughter of Howland Embree Wilson and Ruth Stanley. George was 29 years old at the time and Narcissa was 19 at the time. 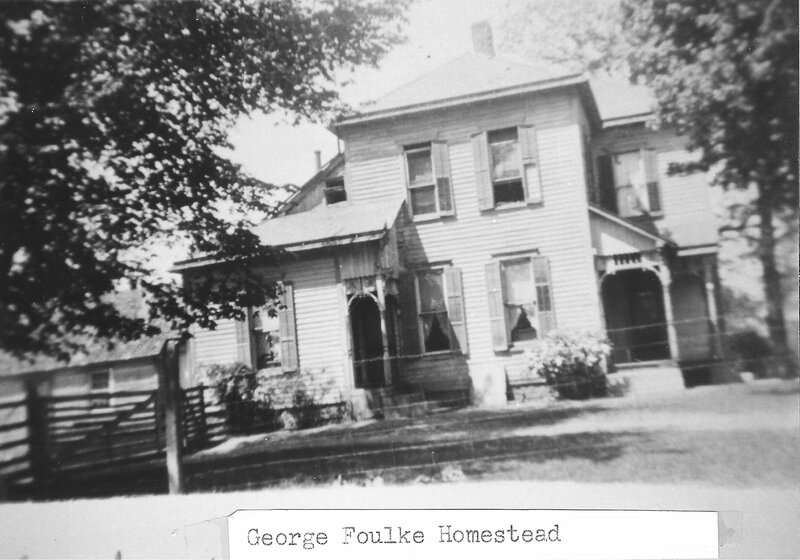 It is supposed that George and Narcissa lived in a home on the Jesse Foulke Farm following their marriage. The George Foulke farm came into existence about this time. Their only child, Jesse Alvin Foulke was born 6 November 1876. Jesse was about 8 months old when his mother passed away on 30 June 1877. Amasa was given the not guilty verdict on 14 February 1875 in the Court House in Noblesville. Four days later Jesse Foulke died of an internal hemorrhage. According to news reports Mary Stayed on the farm for two or three years and then lived the rest of her life with her children. 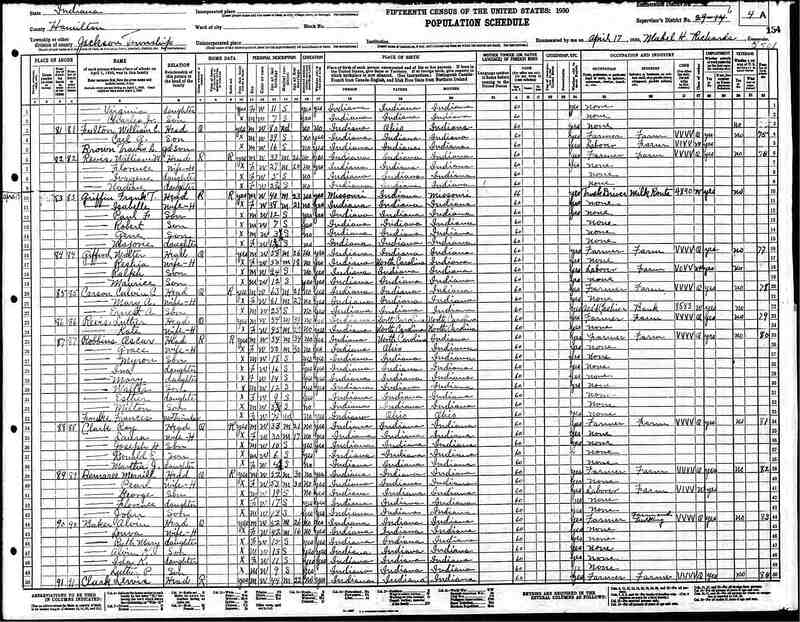 In the 1880 US Census Mary is living with son Amasa and his wife Belle Linder Foulke in Marshall County, Iowa. 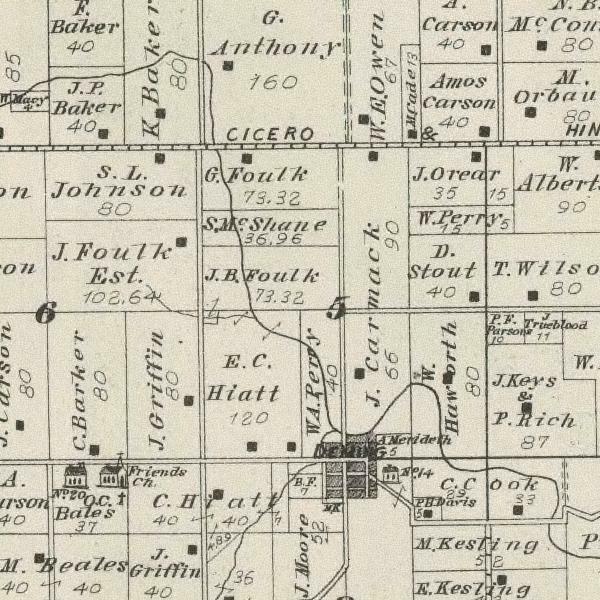 On the 1880 Plat Map of Jackson Township below shows the Jesse Foulke farm has been divided up in the following manner: the 102 acres on the west side of Anthony Road, the home of Jesse and Mary is now listed as the J. Foulk Est. On the east side of Anthony Road are from the north: G. Foulk (George Foulke), 73.32 acres; S. McShane (Sarah Ann Foulke McShane), 36.96 acres; and J. B. Foulk (John Baker Foulke) 73.32 acres. The total acreage of the Jesse Foulke Farm is 286.24. Son William had died in May of 1877 and left his wife Caroline and daughter Mary G. behind. Amasa is not shown to have any of the land given to him. Since I have not been able to locate the probate records as yet for Jesse it is supposed that the 102 acres was sold and the proceeds divided among the heirs, including Amasa and granddaughter Mary G.
The occupants of the Jesse Foulke Farm were as follows: Jesse and Mary Baker Foulke, about 1852 to 1877. The Samuel Brown family purchased the 102 acres in 1877 and lived there until about 1887 when they sold the property to the Alfred Graham family and they lived there until about 1940. After the death of Alfred the land was sold to Jesse Whisman. I have no further records of owners beyond this point. - Could this Mary F. Foulke be a misprint and it should have been Mary G. Foulke, daughter of William? Today the location of the large brick home and the huge barn of the Jesse Foulke Farm is a field and all traces of their existence is gone. From the pictures below the house was large and substantial and the barn was indeed a very large bank barn. These pictures were taken in 1986 and the next research trip I took in the early part of this century showed that it was all gone. Now, to the George Foulke Farm. As was mentioned above the farm probably came into existence in the period around 1868 to 1870 when Jesse and Mary had rented their farm to their sons George and Amasa. According to my father there was a tenant house on this piece of property located east of the big farm house. This home could possibly have been the original home of the George Foulke family until the new house was built around 1890 or 1892. Jesse Foulke was born on 18 Sept 1805 in Bucks County, Pennsylvania. He was the 10th child and the 4th son of Judah and Sarah McCarty Foulke. At the time of his birth they were associated with the Richland mm in Bucks County. On the 22nd day of February 1831 Jesse and Mary Yost made their intention to marry known to the members of Short Creek mm in Harrison County, Ohio where they were married in a ceremony at the meeting house on the 30th of March 1831. The record of the marriage and the list of the witnesses are included in the minutes of the meeting. Jesse and Mary Yost were married for 9 years when Mary died in March 1840 in Highland County, Ohio. Jesse and Mary did not have any children. Jesse and Mary Baker were married in Highland County, Ohio at the Clear Creek mm on 28th of April 1843 which was Mary's home meeting at the time. 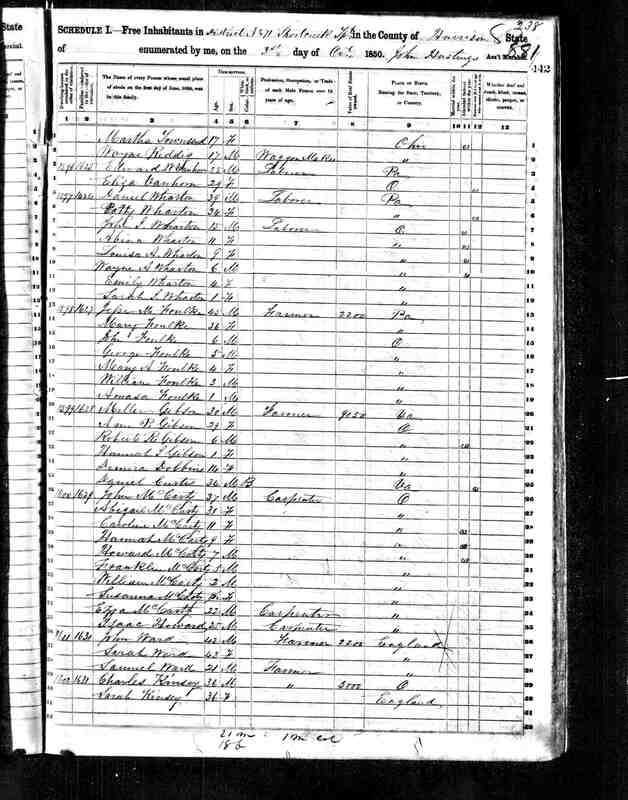 According to the 1850 US Census on October 3rd they were living on a farm in Harrison County, Ohio. At the time they had all five of their children living with them, John Baker was 6 and the youngest, Amasa, was 1. According to records, sometime in the fall of 1852 the family moved from Harrison County to the Hamilton County, Indiana area. They are shown to be a part of the Fall Creek mm in Madison County, Indiana which was close to Hamilton County. So, it is possible they were actually living in Hamilton County but were attending the Madison County meeting. According to the Short Creek mm records they requested a transfer to Fall Creek mm in Indiana on on May 20th 1852 and the certificate was granted on June 24, 1852. According to Fall Creek mm records they received the certificate from Short Creek on Aug 12, 1852. 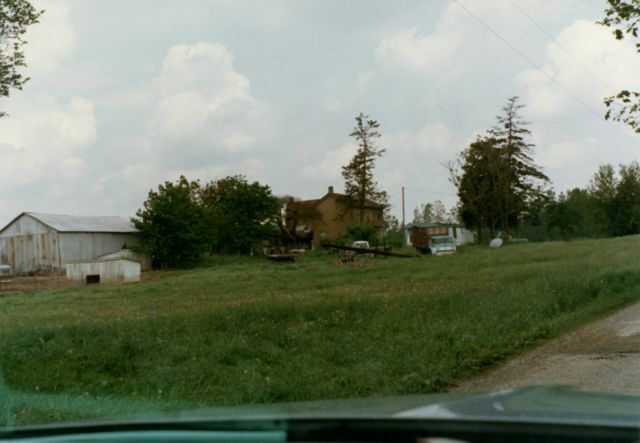 At some point, and it may be the 1852 time period, Jesse purchased 285 acres of farmland in the southwestern portion of Jackson Township, Hamilton County, Indiana. At some point they built a large brick farm house and a huge bank barn. This barn was later home to various meetings, some of which, reportedly concerned Spiritualism. This land, which is shown on an 1880 map as the Estate of Jesse Foulke, was on both sides of what is today Anthony Road south of 236th Street. 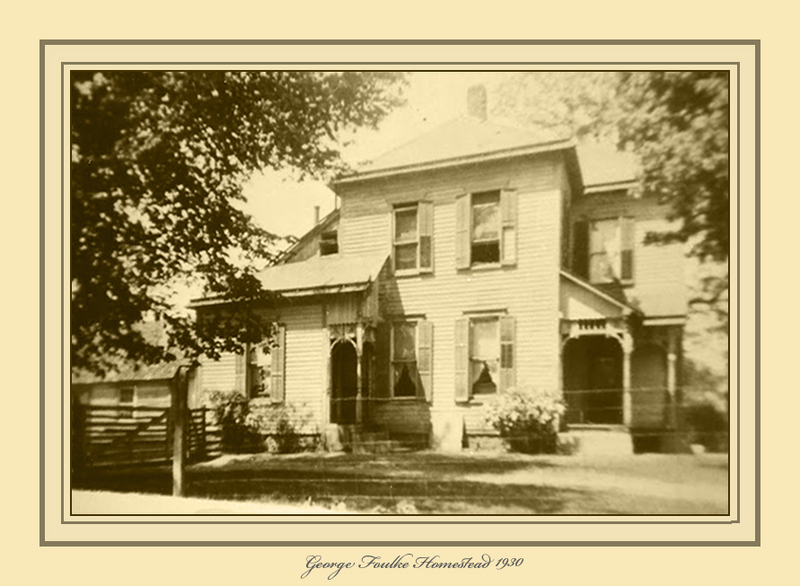 In about 1868 Jesse and Mary rented the farm to their sons George and Amasa and they moved to Westfield. Son Amasa was married to Lucetta Carlisle on August 1, 1868 and Jesse and Mary had a house built for them somewhere on the farm. I belive this house was built on 236th Street just east of Anthony Road. This house would later be referred to as the "Tennant House". In August 1870 Jesse and Mary were living in Westfield, Hamilton county and it was reported in a newspaper article that they were having a new house built in Westfield. Son George was living with Amasa and Lucetta according to the 1870 census. Lucetta was killed by a gunshot wound on Novemeber 16 1873 and died in this Tennant House. Amasa was tried for the murder of Lucetta and was found guilty in the first trial and sentened to life in prison. He was able to get a new trial and in that one he was found not guilty and set free on 14 February 1875. Both Jesse and Mary, along with George and several other relatives and friends testified during this second trial. 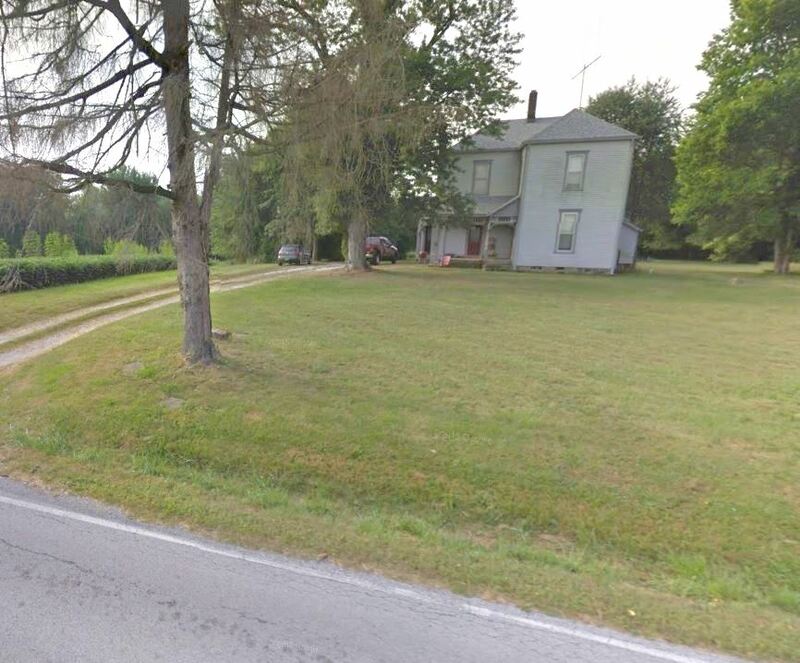 At some point around late 1873 or 1874 Jesse and Mary moved back to the farm in Jackson Township and lived there until the death of Jesse on the 18th day of February 1875. It seems to me that the stress of the trial took its toll on Jesse and probably contributed to his death. According to newspaper accounts he had been in feeble health for several years and he had quite a bit of trouble during the trial. According to one account he died of a hemorrhage of the lungs. Reportedly after Jesse's death Mary continued to live on the farm for a few years but then moved in with some of her children. The farm became part of the estate of Jesse and was divided up. The main farm on the west side of Anthony Road which consisted of 102.64 acres and the farm of son George was listed at 73.32 acres, this farm was located at the southeast corner of Anthony Road and 236th street. The rest of the property, which was located on the east side of Anthony Road, south of 236th Street was divided between son J. B. Foulke at 73.32 acres and daughter Sarah Ann, at 36.96 acres. By 1922 the original 285 acre farm of Jesse Foulke was divided as follows: 102 acres belonging to Alfred Graham, 108.61 acres belonging to Mary F. Foulke and 47.50 acres belonging to M. H. Foulke, who was the son of J. B. Foulke. - (Real Estate would be in Jackson Township rented to George and Amasa? - They are living in Jackson Township along with Jesse Alvin Foulke, son of George and Narcissa Grace Gertrude Foulke daughter of George and Mary Frances. - Shows there are 181 acres on the east side of Anthony road and 103 acres on the West side with the residence being in the north east corner of the West portion with a total of 284 acres. Map of Hamilton County, Indiana, 1866. Waterloo City, Indiana: C.A.. McClellan & Newtown, CT: C.S. Warner, 1866. Obtained from Library of Congress, https://www.loc.gov/resource/g4093h.la000148/ - Accessed 21 Apr 2016. Jesse had died in 1875. Note: Mary lived on the farm until 1934 when it was lost during the depression. She lived with her daughter Sarah and family while they lived there and the with daughter Grace when her family lived there and ran the farm. Mary Frances was living with daughter Grace near Arcadia when she died on 2 June 1935. Route 29 is made up in part of the route of the most famous railroad in history, the Underground Railroad. This road led from the South to Westfield, and Westfield at that time was perhaps more widely known than any other town in Indiana, even including the capital. Westfield was a station, and the route then ran through the Tomlinson neighborhood, by Chester, on north, to Bakers Corner, to Boxley, then through Tipton county to New London, then on, by way of the North Star to Canada, and freedom. About 1856, this Underground Railroad was in full operation. The trains were smokeless and noiseless, but they ran day and especially at night. For Example, the Rhoads family, a colored family, whose son, John Rhoads, later was a character well known in the county and especially at Deming, came up from the South and located just southeast of Bakers Corner, near what was later the Jones Sawmill. The Southern planters located the colored family and came after them. The old man Rhoads' name was John, too, and his wife's name was Lou Ann. There were three girls, Jane Ann, Sallie Ann and Phoebe Ann. The slave driver located the house and he and his fellow slave hunters surrounded the house, but windows and doors in the old log house were barred. Lou Ann Rhoads was full of plans, and she used a straw tick, burning a little straw at a time, to keep the fugitive slave hunters from coming down the chimney. The old man Rhoads struck at one of the men who tried to get in the door, and the slave drive left some of his hair and blood on the door jam. The colored family kept the drivers at bay until morning, and then some of the Bakers and Hodsons and other neighbors heard the disturbance and rallied to save the negroes. Another estate of interest to the people generally, was that of Alfred Graham and his wife, Nellie Eudaly Graham. They lived for many years on what was known as the old Jesse Foulke farm, northwest of Deming. Mr. Graham and also Mrs. Graham had been well known school teachers in the county, living in Wayne township before buying the Foulke farm. They both died and their son died. Ewing Shumack was appointed commissioner to sell the land belonging to Mr. Graham, 102 acres in Jackson township. He recently made the sale to Jesse Whisman, living near Cicero, for $5,500. Homer Graham, died since the proceedings were filed for the sale of the land. The heirs left are Edward R. Graham, living near Columbus, Ohio, Leora Graham, of Tipton; Mrs. Ida B. Waddell, of Wayne township, Mrs. Emma O. Davis, of Anderson; and three daughters, Misses Carrie, Isophene and Imogene, of Noblesville. Newton Wiles, of Cicero, was the administrator of the estate and 40 acres belonging to Mrs. Graham had already been sold, bringing $50 an acre.
. . . The Brown family came to Indiana from Warren County, Ohio, in the spring of 1877. They lived near Westfield, where Wade Furnas now lives, for a time, and then moved near Deming, on the farm well known as the Jesse Foulke farm, where they lived for about ten years. Later the family lived on what was known as the Isaac Stanton place, west of Carmel. . .
Jackson Township, Hamilton County, Indiana - SD6, Sheet 11B, Line 62, Dwelling 74, Family 75. The honoring of the 80th birthday of Mrs. Nellie Eudaly Graham, Sunday, at her home near West Grove Church, in Jackson Township, was a day of interest and delight, as many of her former pupils were present and relatives and friends gathered in large numbers. Mrs. Graham is the widow of Alfred Graham, a former well-known school teacher and farmer of Wayne and Jackson townships. The family home is now on what was for many years the Jesse Foulke farm, northwest of Deming, and here Mrs. Graham has lived for the past thirty-five years, surrounded by the loving care and devotion of her sons and daughters. Miss Esther Tomlinson, a teacher in the county in an early day, and much beloved by a large circle of friends and former pupils, was a guest and was given much attention by the many present. Notice is hereby given that the undersigned will receive bids on or before November 26, 1927, at the Office of Gentry, Cloe & Campbell, for the dale of the Mary F. Foulke farm, consisting of 109 acres, on the Cicero and Sheridan Pike, one mile east of Range Line Road. S13 T.B. Helm, History of Hamilton County, Indiana, Reprint (Chicago: Kingman Brothers, 1880. Reprint: Evansville, Indiana: Unigraphic 1976, Bk1604). 1] Jesse M. Foulke: Head of household, 45 yr old male, Farmer, born Pennsylvania. S15 Obituary, "John B. Foulke, Pioneer of County, Died Wednesday" Noblesville Ledger (Noblesville, Indiana) Repository: Hamilton East Public Library (Noblesville, Indiana), Indiana Room, microfilm, 23 Jan 1924, page 1, Doc2925.pdf. "Mr. Foulke was a lad of six years when his parents came to Hamilton county, in the fall of 1850, and settled near Cicero. Some time later the father bought two hundred and eighty-five acres of land in the southwestern part of Jackson township, and there the family made their permanent home. Jesse Foulke, the father, was a cooper by trade, but after coming to Indiana, he devoted all of his time to farming, although he made a few barrels and kegs for himself and neighbors. He died February 18, 1875, leaving his widow and five children, John B., George, Sarah Ann, William and Amasa. The widow remained on the farm for three or four years, and then spent the rest of her days with her children, her death occurring in 1888." Note: - Page 60, as created by the census taker, lists the place of residence as "Washington Township". Pages 59 and 61, however show the place of residence as "Jackson Township" as it should be. Thus Page 60 is incorrect. ". . . we moved to Westfield some time after their marriage, and rented the farm to defendant [Amasa] and his brother George; we continued to live in Westfield for some time, and then moved back to the farm;"
. . Westfield: George Baker is completing a fine two-story house in the north part of town. Talk of two more going up in the same locality, one by Uncle Jesse Foulke, and one by Hezekiah Collins. .
1] Jesse M. Foulke: Head of household, 64 yr old white male, Retired Farmer, Real Estate Value: $18,000, Personal Estate: $800, born Pennsylvania. 2] Mary Foulke: 55 yr old white female, keeping House, born Pennsylvania. 3] Amasa Baker: [father of Mary] 89 yr old white male, born Delaware.
. . . Some of the Madison County towns call to mind incidents in the history of Hamilton County. 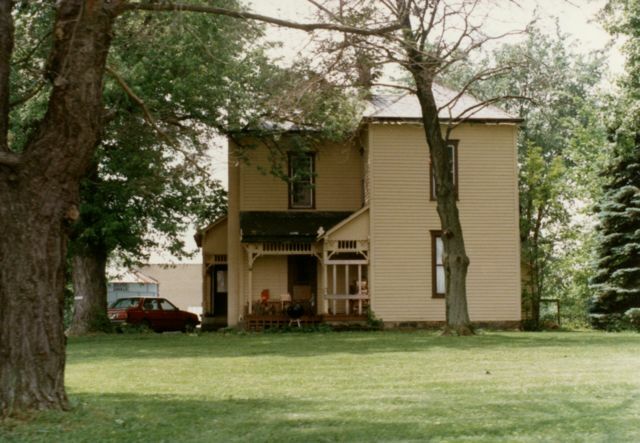 Going through Chesterfield, in Madison county, the seat of the Spiritualists of Indiana, recalls the great debate on Spiritualism at the great barn of Jesse Foulke, northwest of Deming, seventy-five or so years ago. . . He is survived by a wife, three daughters and two sons. The children are Mrs. Oscar Robbins, Mrs. Dr. S. C. Phillips, Mrs. Robert Ross and Alvin and Arthur Foulke. 1] Oscar Robbins: Head of household, 54 yr old white male, married, 34 yrs old at first marriage - rented farm, own radio set, he and his mother born in Indiana, father in North Carolina - Occupation: Farmer - not a veteran. 2] Grace Robbins: 50 yr old white female, married, 30 yrs old at first marriage - She and her mother born in Indiana, Father in Ohio - no occupation. 3] Myron Robbins: 18 yr old white male, son of head - attended school. 4] Ina Robbins: 16 yr old white female, daughter of head, single., attended school. 5] Mary Robbins: 14 yr old white female, daughter of head, single, attended school. 6] Walter Robbins: 12 yr old white male, single, attended school. 7] Esther Robbins: 9 yr old white female, daughter of head, single, attended school. 8] Milton Robbins: 3 yr old white male, son of head. 9] Frances Foulke: Mother-in-law of head - 76 yr old white female, widow, born in Indiana, parents in Ohio. - the children and their parents born in Indiana. S23 Haines, John F. History of Hamilton County, Indiana: Her People, Industries and Institutions. Indianapolis, Indiana: B. F. Bowen, 1915, Bk2922, Page 703. "John B. Foulke was a lad of six years when his parents came to Hamilton county, Indiana, in the fall of 1850, and settled near Cicero. Some time later the father bought two hundred and eighty-five acres oaf land in the southwestern part of Jackson township, and there the family made their permanent home. Jesse Foulke was a cooper by trade, but after coming to Indiana, he devoted all of his time to farming, although he made a few barrels and kegs for himself and neighbors. He died February 18, 1875, leaving his widow and five children, John B., George, Sarah Ann, William and Amassa. The widow remained on the farm for three or four years, and then spent the rest of her days with her children, her death occurring in 1888." The smokehouse with its contents, on the farm of George Foulke was destroyed by fire Sunday [18 Feb 1900] afternoon Mr. Foulke was considerably burned about the face and hands in his efforts to save his dwelling. The fire originated from hot ashes. The loss is over two hundred dollars. "Cicero, R. R. 1" Noblesville Ledger (Noblesville, Indiana), 21 Feb 1928, page 2, Col. 2. newspapers.com, accessed 13 Feb 2018. Claude Pickett has been moving more of his farming implements to the Mrs. George Foulke farm where he expects to move the first of march. On Sunday the smoke house of George Foulke, one mile north of Deming, was burned with all its contents, meat, lard, etc. "Cicero, R. R. 1" Noblesville Ledger (Noblesville, Indiana). 11 Feb 1928, page 5, Col. 4. newspapers.com, accessed 27 Feb 2018. Mr. and Mrs. Claude Pickett, who have resided on the Clay Kinsey farm for the past five years, will move soon to the farm of Mrs. George Foulke, west of Cicero. Mr. and Mrs. Hershell Cook, living on the George Foulke Farm, five miles west of Cicero, are the parents of a new son that tips the scales at seven pounds. S42 Newspaper Article, "Will Make Butter on a Large Scale" The Hamilton County Ledger (Noblesville, Indiana), 11 Oct 1904, page 1, Col. 5. Newspapers.com, accessed 2 March 2018. Doc4673.pdf. 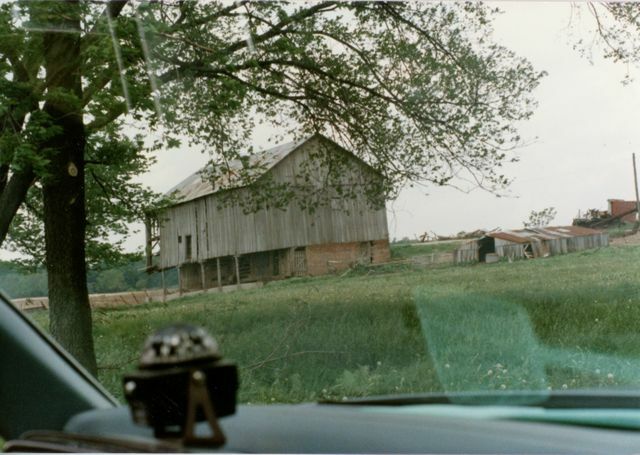 N1: This picture was taken on 17May 1986 during a Research Trip through Hamilton County conducted by my Uncle Myron Foulke Robbins, Sr. The pictures were taken from his car as we drove and he would stop and point out places of family interest.